Francis (Frank) Crowninshield, the son of Frederic Crowninshield and Helen Suzette Fairbanks Crowninshield, was born on 24th June, 1872. His father was a painter and served for two years as director of the American Academy in Rome. Crowninshield was educated in New York City where one of his fellow students was Condé Nast. It was the beginning of a life-long friendship. Like his father, he had a strong interest in painting and he eventually became art critic of The Century Magazine. During this period he promoted the work of modern artists such as Pablo Picasso, Henri Matisse, Jules Pascin, Édouard Manet, Edgar Degas and Pierre-Auguste Renoir. He also purchased some of their work and these were later sold at a large profit. In 1909 Condé Nast purchased a small society magazine called Vogue. He employed Crowninshield as editor and over the next few years he turned it into the country's main fashion and lifestyle magazine. It was also published in several European cities including London and Paris and it became a highly profitable aspect of Nast's growing magazine empire. Nast also decided to establish a new magazine, Vanity Fair. He asked Crowninshield for advice. He replied: "Your magazine should cover the things people talk about... Parties, the arts, sports, theatre, humor, and so forth." Nast realized that Crowinshield was the best man to edit the new magazine that was launched in January 1914. Crowninshield told his readers: "We, as a nation have come to realize the need for more cheerfulness, for hiding a solemn face, for a fair measure of pluck, and for great good humour. Vanity Fair means to be as cheerful as anybody. It will print humour, it will look at the stage, at the arts, at the world of letters, at sport, and at the highly vitalized, electric, and diversified life of our day from the frankly cheerful angle of the optimist, or, which is much the same thing, from the mock-cheerful angle of the satirist." Frank Crowninshield, Edna Chase, Condé Nast, Dorothy Parker and Robert Benchley. In 1919 Crowninshield began taking lunch with a group of writers in the dining room at the Algonquin Hotel in New York City. The writer, Murdock Pemberton, later recalled that he owner of the hotel, Frank Case, did what he could to encourage this gathering: "From then on we met there nearly every day, sitting in the south-west corner of the room. If more than four or six came, tables could be slid along to take care of the newcomers. we sat in that corner for a good many months... Frank Case, always astute, moved us over to a round table in the middle of the room and supplied free hors d'oeuvre. That, I might add, was no means cement for the gathering at any time... The table grew mainly because we then had common interests. We were all of the theatre or allied trades." Case admitted that he moved them to a central spot at a round table in the Rose Room, so others could watch them enjoy each other's company. 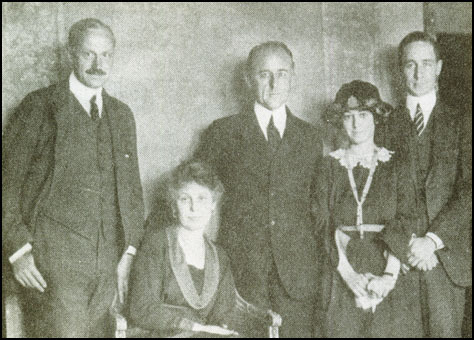 This group eventually became known as the Algonquin Round Table. 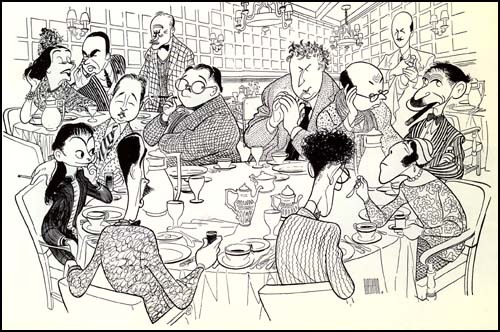 Other regulars at these lunches included Robert E. Sherwood, Dorothy Parker, Robert Benchley, Alexander Woollcott, Heywood Broun, Harold Ross, Donald Ogden Stewart, Edna Ferber, Ruth Hale, Franklin Pierce Adams, Jane Grant, Neysa McMein, Alice Duer Miller, Charles MacArthur, Marc Connelly, George S. Kaufman, Beatrice Kaufman , Ben Hecht, John Peter Toohey, Lynn Fontanne, Alfred Lunt and Ina Claire. In 1921 Crowninshield moved in with Condé Nast. Crowninshield commented: "I suppose people thought we were fairies." Amy Fine Collins gave another explanation: "the situation providing the editor with posher accommodations than he could otherwise have afforded, and his boss with access to Crowninshield's far-flung and comprehensive social connections." Crowninshield, who never married, told his friend, Alexander Woollcott: "Married men make very poor husbands." Crowninshield met Clare Boothe in 1929. At the interview he asked her to come back in a week's time with 100 suggestions suitable for publication in Vanity Fair. On the result of this exercise he gave her a job on the magazine. Clare asked if that meant her ideas were good ones. Crowninshield replied: "No, my child. Some of them are perfectly dreadful. but two at least are excellent. And one good idea a week is about all a magazine should expect from a novice assistant editor." Frank Crowninshield died on 28th December, 1947.